Home / Algemeen / Hoe kan je de veiligheid van Data en Brands garanderen? 2019 is the year that digital advertising spending surpassed television's ad revenue. The data that drives all that online ad spending is itself a $10 billion business. And, yet the market for 3rd party targeting/audience data is still the wild west and shows no signs of changing. 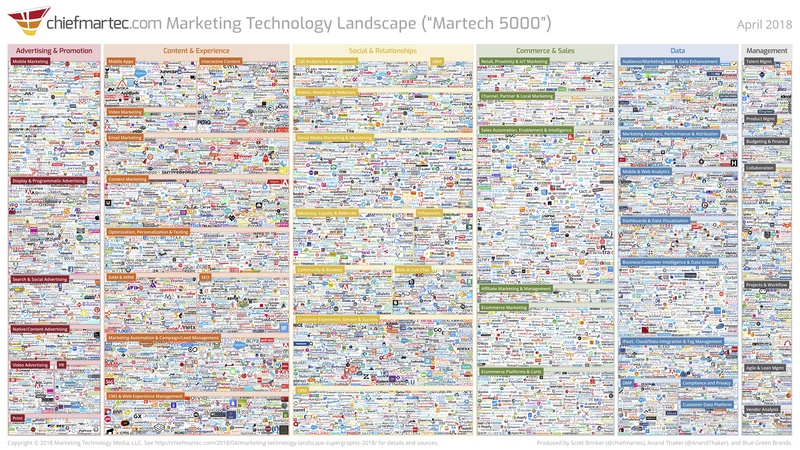 In fact, the latest ChiefMarTech.com landscape shows nearly 8,000 companies are in the mix for mar tech, ad tech and data services. We are a long way from consolidation. At the same time, consumers and governments are asking hard questions about privacy and how personal data is being used. GDPR is now in effect in the EU and a similar law will roll out in California in 2020. Marketers are also asking hard questions about what they are actually buying in the data and audience market. Twenty-five years into this business and there is still no real labeling or verification/audit service similar to the circulation audit system for print publications. It is buyer beware when it comes to the accuracy, composition and recency of any 3rd party data segment you use. Additionally, there are liability issues around consent that could trigger a significant fine from the EU. To see an illuminating and occasionally amusing 3rd party example, go to the Blue Kai registry where they allow consumers to view the data segments they belong to and gives them a tool to opt out. I am personally listed in various age and income segments not to mention genders. In fairness, a lot of the data about my personal interests and professional buying behavior are correct, but some of it is comically wrong. I am in ad segments of people who speak Russian, are fans Louie Anderson, horror films and wedding planning (I was married in the pre-web days). And, I am interested in beauty products and the salon business. I can assure you, none are remotely true. The errors speak to the flaws in the data collection process. It is built on probability and modeling that projects individuals into segments based on other "real" data. There is also the problem of false signals. Coming upon a web page in error triggers a signal of interest or intent - maybe that's the deal behind by my Louie Anderson fandom. Then there are recency concerns. Five years ago when I was working for an agency, I helped create a new website for a chain of haircutting salons. So, putting me in the salon business segment is kind of true, but the timeframe is way off. However, the biggest issue with false signal is the context. While I checked out a few competitors in the salon business it was a short-term thing, I was not actually in that business then and certainly not now. However, if a company targeting salon owners bought that segment on the open market today, they'd get me. What are Marketers to Do? B2B marketers should be thinking about their data strategy and asking hard questions of their 3rd party data providers. In fact, a recent study from Sizmek states that 85% of US marketers plan to increase their use of 1st party data. Many data vendors are reputable companies who do a very good job with data science and keep data clean and recent. Others are VC funded companies looking for quick revenue to speed their exit - do your homework. Where did this data come from, and what has it been combined with? How is the data collected? Is it based on direct contact or modeling? How do you ensure the accuracy of the data composition? What is informing that? Do you have the proper permissions in place? Savvy tech marketers are focusing their targeting efforts on pairing their own customer data with 1st party data that comes from media companies like IDG. Media companies have a constant flow of data from their direct connection to the audience, as well as have the opportunity to confirm consent and maintain a schedule to cleanse the data. But, the most valuable part of this relationship is context, insights based on actual behavior and actions taken. If an IT decision-maker reads multiple articles on hybrid cloud on a site like InfoWorld.com, we can conclude that in fact, he/she is showing strong interest in the topic and may be in the market for a hybrid could solution. And, if companies pair their 1st party customer or target account data with IDG's data, they are increasing the efficiency of their marketing. The biggest advantage is the proper context and environment in which the content is presented, providing a brand safe environment. Of course, there is a place for modeling and extending your reach with 3rd party segments, but your data plan should begin with a strong 1st party data strategy. Kun je van gebruikers wisselen zonder wachtwoord in te voeren?